Turn your backyard into an enchanted bird garden with the Heartwood Antique Cypress Ye Olde Birde House. The curved frame, cypress construction, and red tones of this item bring storybook charm to your yard, as well as create a welcome home for songbirds. A steeply pitched roof covers this shelter, with red, cypress shingles and copper flashing on the ridge adding eye-catching color to it. A red, faux door on the front of the unit enhances the roof tone, while a diamond-shaped imitation window lends more angles to the piece. A 1.5" diameter hole is offset between the door and window shape, allowing birds to enter the roost. The base flares outward for plenty of nesting room, and gaps beneath the roof overhang keep the unit ventilated. The varied brown tones mesh with your nearby trees, and a cleanout panel on the back of the item allows for seasonal removal of old nests. A hanger here also helps you place the accent on a tree or post easily. The cypress construction will remain hardy for many seasons of use, and copper flashing on the roof ridge adds unique style. 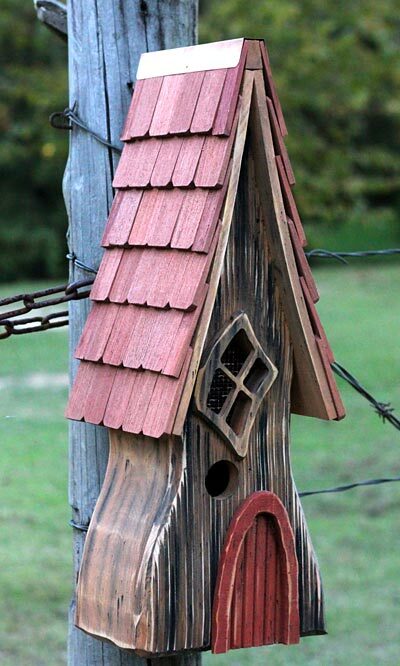 Bring songbirds a fairy tale home of their own by adding the Antique Cypress Ye Olde Birde House to your backyard. Made in the USA.